Kelly’s yoga journey began at age fifteen. Curious to explore what she thought at the time would be a way for her to enhance flexibility to assist with her love of dance/creative movement. Amazed at the effect in assisting to help calm the central nervous system, after years of practice in 2016 Kelly completed her 700-hour teacher training with Byron Yoga Centre. Feeling inspired to specialize in her training further Kelly was quick to follow up with Yin Teacher Training with Jo Phee and Trauma Aware Yoga Training with Shirley Hicks and recently some restorative teacher training with Idit Hefer Tamir. Yoga has had such a positive impact on Kelly’s life, she is continuing to learn and grow through this amazing healing modality and it offers her such joy and purpose to share her love of yoga with others. 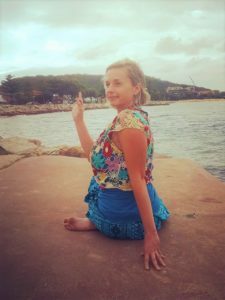 Coming from a background in mental health nursing and Remedial massage, her interest in the mind body connection has kept her curious in her learnings and willing to support and advocate for those experiencing difficult times and challenges. Yoga has taught Kelly so much about life, connection and healing from within.